Here we are in the last half of June – this means it is time for the blogger bundle of the month! If you are reading about these bundles for the first time, I started this project in January. Read about them here and here. 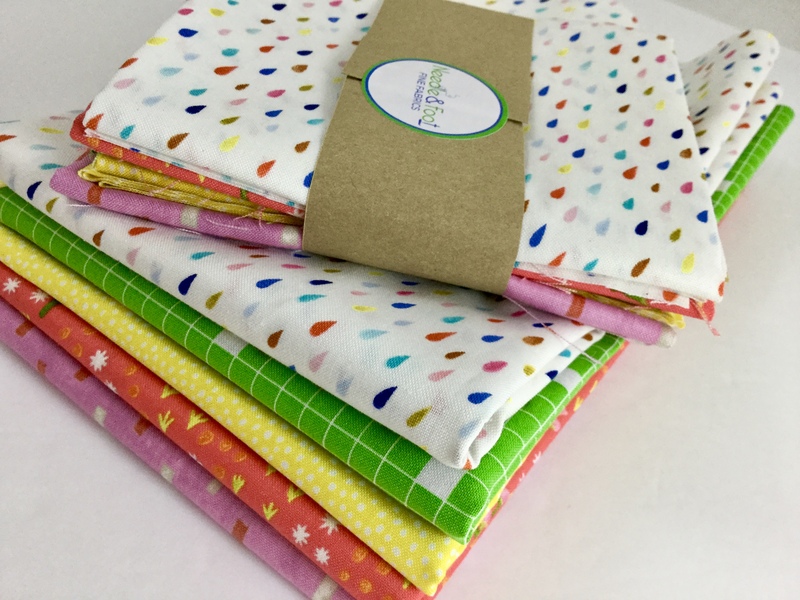 The previous blogger bundles will be available in my shop through the end of 2018 – it is really fun to look at the variety of fabrics others have curated into collections. Click here to see all of them! 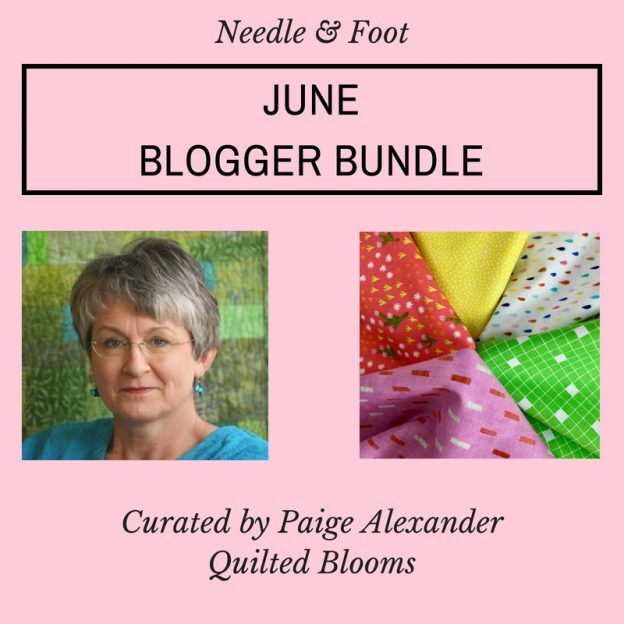 The bundle for June was curated by Paige Alexander of Quilted Blooms. I cannot remember exactly how I learned of Paige’s blog but I do know I have read her posts since the very first one. I believe a blogger (maybe Cheryl Brickey?) introduced the me to Paige and suggested I check out her work. I did so and never left! Paige’s style is very modern and also relatable. I am not sure if that is the correct word but I love her work because I understand it. Her quilts are meticulous, clean and very effective. Above is Paige’s Cursive quilt, She made this about two years ago and it has been juried into several shows and won several ribbons. It is one of my favorite quilts she has made. Partly because she constructed the background, quilted it and then did the appliqué. Look closely and you will see she quilted line after line of the alphabet in cursive. This was a genius technique. I really encourage you to check out her work if you are not yet familiar with it. On to the bundle! Paige selected a grouping of summery pieces that all hail from Windham Fabric. As we head into summer, this fresh palette of green, orange, yellow and pink are akin to a bouquet of flowers. She chose pieces that are really cheerful and bright – I love each one of them! I think this bundle would be excellent used together in a project or added to your stash to give it a bright pick-me-up! 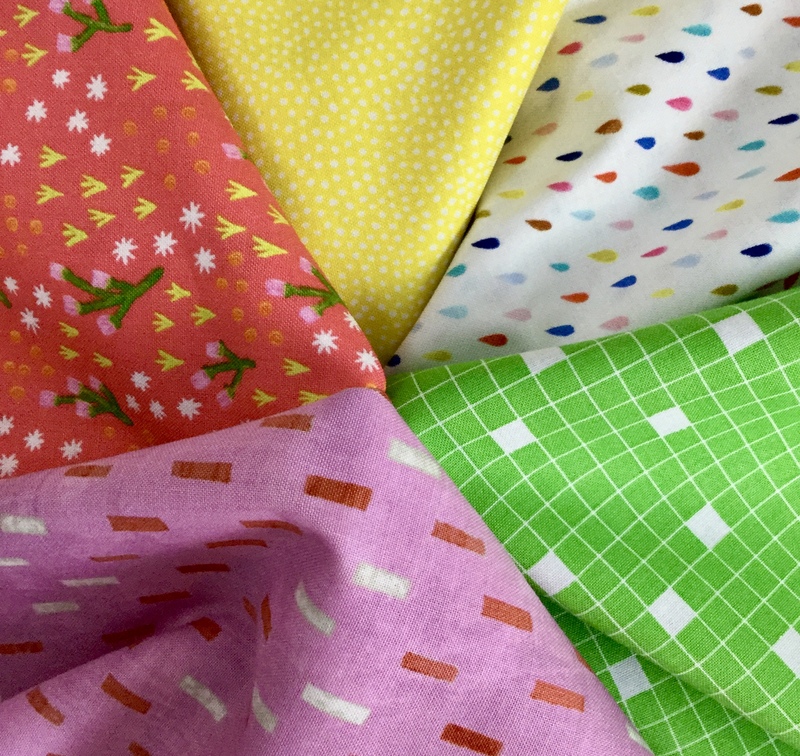 Paige has been working on a piece with these fabrics and I am really excited to check it out – I had a sneak peek a few weeks ago and it is going to be really pretty! While the project is not yet finished, Paige is sharing her progress with us today. Make sure to take a look! 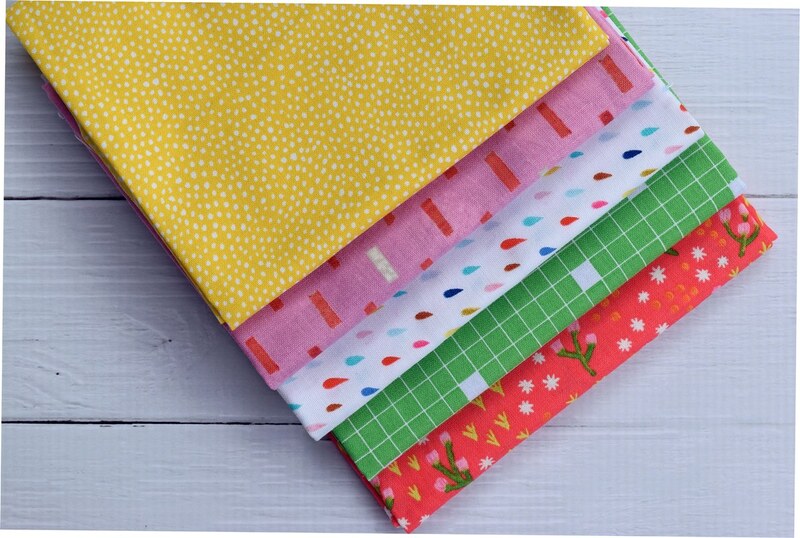 As with prior blogger bundles, this one is now available as either a fat quarter or 1/2 yard bundle in my shop. I have placed it on sale, 20% off, for the next couple of days. Sale ends Friday. Paige is hosting a giveaway for one lucky winner (US only due to postage expense). Be sure to go to her site to enter!! I hope you are enjoying this Blogger Bundle series as much as I am. I have learned so much about color choices through working with these talented quilters! This entry was posted in Etsy, My Fabric Shop, Stash and tagged blogger bundle, curated bundle, Paige Alexander, quilted blooms on June 20, 2018 by Bernie. Love these wonderful, bright colors! Me too!! Paige curated a fun collection. Paige picked some beautiful bright prints. 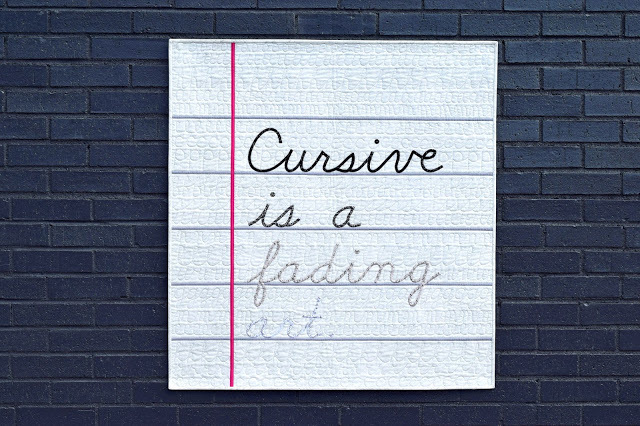 I’ve loved her cursive art quilt since I first saw it. It’s very impressive from the concept to the fabric selection to the quilting of it. So glad she was able to put together a beautiful bundle for you. Absolutely agree on your comments about her Cursive quilt. It is simply wonderful. Paige did an outstanding job putting together this bundle! I have had a sneak peak of her project and can’t wait to see it completely finished. These fabrics are absolutely making it sing! I agree! It will be fun to see the finish! Bernie, you’re so sweet! Such kind words! Curating this bundle was so much fun, so thank you for the invitation! Paige chose some fun fabrics, and it’s interesting to see what she doing with them. Will certainly be cute! For sure – I love the summery theme of her appliqué project – it fits the fabrics to a T! I agree. Paige did a great job putting the bundle together.